Alynne is 2 years and 9 months old today! I can't even believe that we almost have a 3 year old on our hands! As of late, Aly loves to tell people that in the Fall she will be three and Fynn will be one! So I'm not going to lie, I completely forgot to jot down fun moments or things Aly said this month. So this post will be short and just what I can remember off the top of my head haha. -One day while running, the elevator down to the park was broken. Aly said, "We can try again tomorrow, does that sound fun Mami?" -After someone asked if they could help her with something: "No thank you, but thanks for offering!" I love how polite she always is. -"Please don't go on a date." We have had lots of goodbyes this month with friends moving out of the city, particularly our best friends the Schmidts. I know Aly already misses Galilee! We've had lots of outdoor adventures. 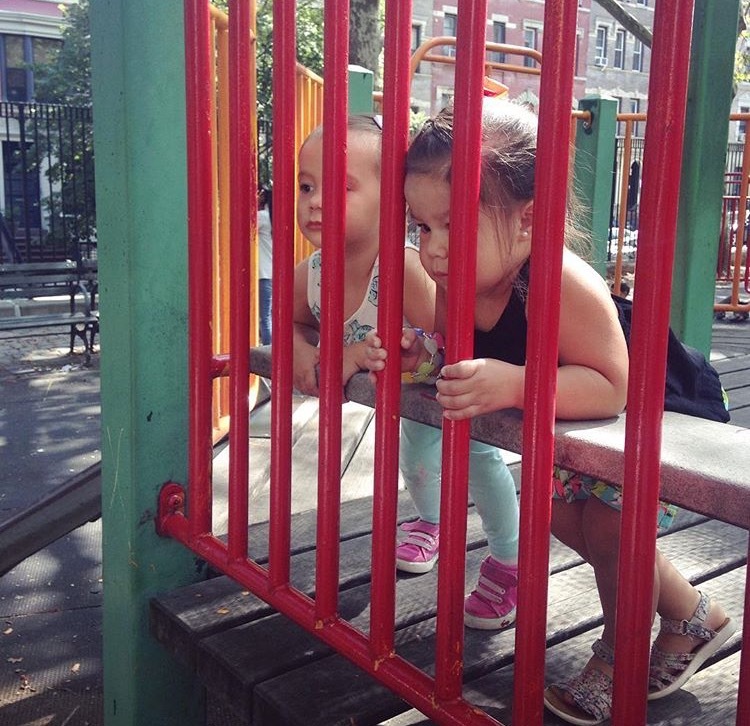 Alynne loves going to the playground and has enjoyed showing Fynn the ropes. One night, instead of sleeping, we caught Aly and Fynn holding hands on the baby monitor. It was the most precious thing. I cherish their friendship so much and pray it only strengthens with time! Aly and Papi have such a special relationship. She has started crying when he leaves for work, asks for him all day, has pretend conversations with him during the day, and watches out the window for him the last hour before he comes home. She loves him so much. Aly is a very bright child. Lately, she has started asking me what letter words start with (though she often asks it backwards-- "what does B start with?") I've been so impressed with this, because it's not something we've spent a lot of time talking about yet, but she already can state what most words start with! I may need to change up my Tot School plans for this year haha. She also is getting very good at writing and has started drawing meaningful pictures. She really is getting so big! Aly is such a silly little girl, it's one of my favorite things about her. She acts silly all the time and loves to make us laugh. Often times, she'll ask me, "what's so funny?" and I'll say, "you are!" and she bursts into giggles saying, "I know I am!!" These last few days have been filled with lots of family fun because Uncle Jason and Aunt Lexxie got married today!! Aly and Fynn were both in the wedding. We are so happy for them, today has been such a special day! Aly was adorable in the wedding. She dumped all of the flowers and then ran down the isle haha. She also commentated the wedding. When Lexxie started tearing up, Aly said, "Is Lexxie sad??" haha. Aly has loved getting to play with and see so many family members this weekend! What a treat. We love this little girl so much! Each month is more fun than the last! Ready to take on the world, with Papi by her side. Sleeping in Mami & Papi's bed!